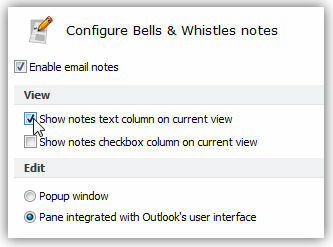 Bells & Whistles for Outlook introduces a new Outlook email concept: email notes attached to Inbox email messages. The goal of this feature is to allow you to quickly record a text (comments, ideas, to-do, etc) within Outlook, while keeping it related to a certain email subject. When you write your text, you can also attach a date stamp on it in order to help you remember when you actually added the note to that email message. 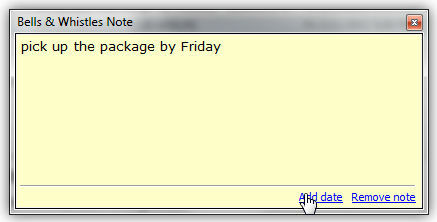 Then, just click on the "OK" button and Outlook will save the note, attached to the selected email message. if you select the related Outlook message, then click on the Notes button/icon displayed on the Bells & Whistles toolbar, the notes window will be displayed. You can also copy or move Outlook notes from one computer to another, by using the Export & Import function of Bells & Whistles for Outlook.